2-Volumes, $325.00, plus sales tax in California and Connecticut. 30-day return privilege. Free future supplements if issued within 6 months of purchase. A completely rewritten, up-to-the-minute edition of the only text devoted to this difficult topic. 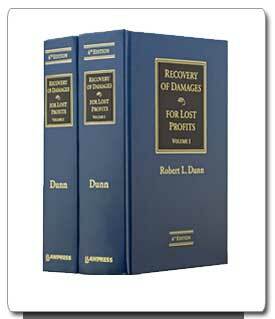 Frequently cited by the courts as authority, this widely owned treatise provides an incisive, well-organized analysis of every significant lost profits damages case in the federal and 50-state jurisdictions, plus invaluable practice guidance that explains how to calculate, present, and prove lost profits damages.